If you're in search of a casual yet totally stylish look, consider pairing a black and white horizontal striped crew-neck sweater with black leather skinny pants. Both garments are totally comfy and will look fabulous together. Navy low top sneakers will deliver a more relaxed feel to your outfit. 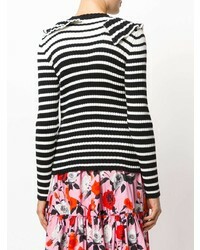 If you're on a mission for a casual yet chic outfit, reach for a MSGM striped jumper from farfetch.com and black skinny jeans. Both items are totally comfy and will look fabulous paired together. When it comes to footwear, this look is round off wonderfully with black suede low top sneakers. Who said you can't make a style statement with a casual ensemble? Draw the attention in a MSGM striped jumper and a blue denim button skirt. When it comes to footwear, this look is finished off wonderfully with black leather ballerina shoes. If you're looking for a casual yet totally stylish look, opt for a MSGM striped jumper and grey wool skinny pants. Both pieces are totally comfy and will look fabulous together. Amp up the cool of your look by rounding it off with black leather pumps. If you're a fan of practicality dressing when it comes to your personal style, you'll love this uber cute pairing of a MSGM striped jumper from farfetch.com and white chinos. Got bored with this ensemble? Enter tobacco suede ankle boots to shake things up. 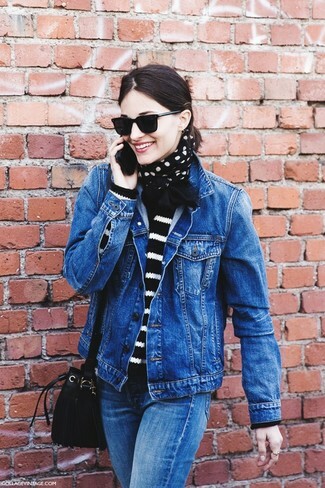 If you're after a casual yet absolutely chic look, try teaming a MSGM striped jumper with blue jeans. Both pieces are totally comfy and will look fabulous paired together. 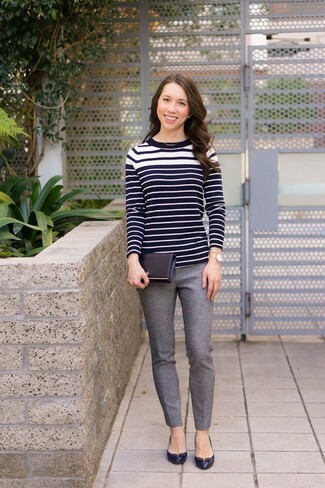 If you're on a mission for a casual yet totally chic outfit, wear a black and white horizontal striped crew-neck sweater with black skinny jeans. Both items are totally comfy and will look fabulous together. Up the cool of your getup by wearing tan suede ankle boots. Choose a MSGM striped jumper and a black mini skirt, if you feel like comfort dressing without looking like you don't care. Elevate this ensemble with black suede ankle boots. 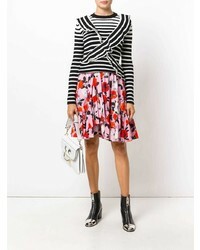 If you're looking for a casual yet totally stylish look, make a MSGM striped jumper from farfetch.com and a black button skirt your outfit choice. Both pieces are totally comfy and will look fabulous together.